“I will start on Monday!?! Isn’t that what we all say when deciding to go on a “diet”? I know that I have said this many times before. With my wedding as motivation, I decided it was time to make some drastic changes if I wanted to be healthy and lose weight in the process. I increased my bootcamp classes, added personal training, and asked for a food plan. Combining all of these factors helped me to learn the benefits of increasing my weights, what my food intake should look like and that it truly is a lifestyle change that I need to maintain. There are no quick fixes. Believe me I tried! 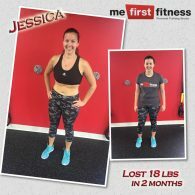 “After I had my second son in August 2014, I knew that it was time to refocus some time and energy on myself. First introduced to Me First Fitness by way of the very first Wag Jag, I had been enjoying the challenging work outs for a few years already (right up until my 35th week of pregnancy thanks to some awesome modifications from the trainers!). 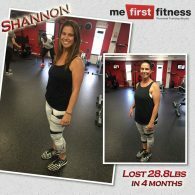 The club had always inspired me – through trainer motivation, the positive energy from the other clients, and the friendships that I have made along the way. Although I was very committed to the exercise portion of a healthy lifestyle, I never really had a good understanding of just how important the nutritional aspect is for me. Six weeks post partum, I returned to Me First at 215lbs, and I knew that I needed some guidance. 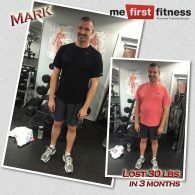 I began personal training with Mark. The first thing that happened was that he gave me a new way of eating. He showed me the things that my body needed, and what I needed to cut way back on (and in case you are interested, CHEESE was high on my personal list). I was not happy about these changes, but decided that I was going to commit to this healthy eating plan the way I had always been committed to exercise. I lost 9 lbs my first week. I continued training with Mark weekly, attended the same amount classes that I had previously been doing, followed a meal plan, and the weight just kept on coming off. “The past year has been one the most difficult of my life. My son was diagnosed with a very serious illness so during that time my only focus was his health. Living in a hospital doesn’t give you the opportunity to eat a balanced diet or exercise. As a result I gained over 20 pounds, suffered hair loss, high blood pressure and high blood sugar. Once my son regained his health I knew I had to make some changes for myself. 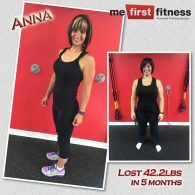 “I was referred to Me First Fitness through a friend about 3 years ago as I was looking to mix up my workout regime. I felt as though I kept hitting a plateau after a certain period of time with other fitness techniques, nothing seemed to be able to stick. So I decided to give Me First a shot by buying a 10 pack of classes through groupon. Everyone was so welcoming and each class gave me a good challenge. I purchased a 3 month membership after that which then eventually lead to an annual membership. Even after developing a workout routine, I still wasn’t getting the results I wanted. 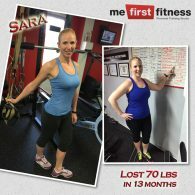 I realized I needed the extra push so I signed up for a 12-week personal training program. I was given a meal plan and had a personal training session once a week on top of my regular boot camp classes. The support from everyone was overwhelming and gave me that extra motivation I was looking for. By following my meal plan and combining that with the workouts I was already doing, I was able to lose 20lbs in 12 weeks. Throughout those 12 weeks I learned a lot about what I was putting into my body and the effect certain types of food can have. I was able to change my eating routine by having meals/snacks more frequently, drinking more water and controlling my portion sizes to name a few. “I’ve been training with Mark for a year now. The results I’ve achieved to date are largely due to Mark’s perfect combination of training methods, individualized programs and challenging yet achievable goal setting. One of the greatest benefits of personal training is that I have an expert to show me the way and map out each session to meet my needs. Mark’s professionalism, extensive knowledge and enthusiastic commitment to his work and ultimately his clients, provides the perfect scenario for success and sets foundations for a new healthier lifestyle. “I have always been athletic and enjoyed sports, however I put my own interests aside 12 years ago when I became pregnant with the first of my four children. I told myself that whatever weight I put on during my pregnancy would easily come off. Boy, was I wrong. In 2012, my fourth child was born. That’s when I began to work out at home, and I managed to lose a few pounds. My friend Carrie and I used to go for Breakfast and Lunch pretty frequently. One day we both decided we should do something healthier and become active together instead. We decided to look into Gym’s to become fit. I joined Me First Fitness in 2014 and I was able to keep that weight off until 2015. That’s when I had two big setbacks — I lost my Dad, and I had surgery on my leg. I kept making excuses for not returning to my workout routine. It was Christmas time when I finally stepped on the scale, as my clothes were getting snug and uncomfortable. I was shocked to see I had gained an additional 15 lbs. That is the moment I decided I needed to make some changes. Me First Fitness was advertising a Body Shred Challenge for the New Year as the calendar turned to 2016. I was hesitant to take part, but Mark and a few of the members convinced me to give it a try. Through the challenge I learned that there is definitely a balance between eating the right foods and exercising in order to lose weight. Although I did not win the challenge, I won personally. I lost 22.8lbs and 4.9% Body fat. My goal for the challenge was to lose 30lbs in 60 days. I still had a few pounds to go, so I kept going after the challenge ended — eating healthy, exercising, and tracking my caloric intake on a daily basis using the My Fitness Pal app. 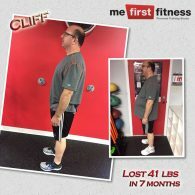 “I wanted to write this testimonial because Mark and his amazing team have helped me lose over 50 lbs in 1 year. 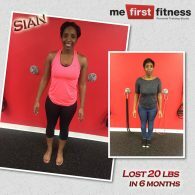 The classes at Me First Fitness are fun, interactive and an amazing work out. The entire gym is welcoming and warm. I moved to Ajax without knowing anyone and now I bump into people from the gym at the grocery store. 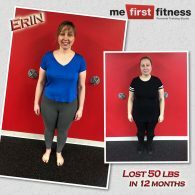 Me First Fitness is incredible!! If you want a supportive, friendly and encouraging gym this is the place to go. 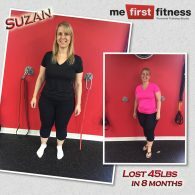 “After joining nearly 3 years ago, I’m still enjoying the many benefits of Me First Fitness. The mix of boot camps offered means there’s something for everyone. The instructors keep things interesting by varying movements and activities within each session. Classes are adjusted to keep things challenging for more the more experienced members, but they make sure it’s not overwhelming for the novice. “Approaching 56 years old and weighing in at close to 270lbs took its toll on me. Searching for XXL tops, size 42 pants and needing a stair for my foot so I could to tie my shoelaces wasn’t too pretty either. 4 years ago I did have success with a protein diet. Once. After putting all the weight and more back on, I knew that wasn’t the answer. I googled and discovered Me First Fitness. When I came in to meet Mark, I knew instantly that his studio was different from anything I knew about a typical gym and that he was not your everyday sales rep for the mass market money charging machines. Clean, neat, quality, pleasant, professional, comfortable, inviting, encouraging- those are the words I choose to describe this small and happy studio.Trainers and clients alike, people of all ages and from all walks of life creating a vibe of positive, uplifting energy, be it upstairs in the personal training area or downstairs in the boot camp studio. After 7 months, I can’t get enough. With the combination of personal training and boot camp classes, not only have I lost weight but my strength and endurance have multiplied way beyond my expectations. The classes are designed and led by all the trainers allowing for maximum variety and style all while providing an excellent social environment.